During the summer we expose our feet to water, the sun, and many other things we can’t see. 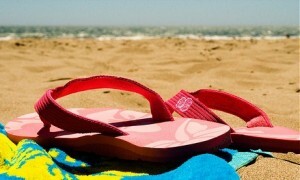 Going barefoot is tempting, but always wear shoes to protect your feet from sunburn, injury and infection. Always stay hydrated and this will assist with swelling and your overall health. At Skin Perfect we have come up with 4 main steps to keep your feet looking great for the summer. Step 1 Sunscreen – Always apply sunscreen to the tops of your feet. When you are going in and out of the water the sunscreen will wash off. With so many different types of sunscreens out there, you will want to buy one with a higher SPF and one that is waterproof. Be sure to reapply after you get out of the water. This way you know your feet will be protected from the harsh summer sun. Step 2 Soak – A great way to soak your feet at home is to combine 1/2c of vinegar, 1/2c of mouthwash (blue works best! ), 2c of hot water, and 1/4 Epson salts and then soak for 10-20 minutes. This soak will leave your feet feeling fresh and soothing. All of these ingredients combined will help you shed dead skin cells. Step 3 Buff – Buffing our feet after soaking will help the dead skin slide off. You can purchase a buffer in store or make your own at home by combining brown sugar and olive oil. For men we recommend using a pumice stone. Step 4 Hydrate – Lastly you want to hydrate your feet. To do this you can purchase cuticle butter or hydrate at home using coconut oil or petroleum jelly. Just rub on your heels and sleep with socks on a couple times a week to achieve soft feet! We hope these steps help you to treat your feet this summer! © 2012-2019 Skin Perfect Clinic. All rights reserved.